P.F., U.S. Too Much for V.C. HIEP HOA - Since moving to the Hiep Hoa area near the Sugar Mill, the combined forces of the 2nd Battalion, 27th Infantry, Wolfhounds, reconnaissance platoon and their Popular Forces counterparts have been a real thorn in the sides of the enemy in his efforts to move supplies and personnel from staging areas inside Cambodia. In recent activity southwest of Fire Support Base Dixon, the forces combined to kill four NVA and uncover a small cache they apparently were guarding. Acting on intelligence reports that seven NVA were in the area, the allies began just south of FSB Dixon to search for the enemy. "We hadn't gone very far when our point man spotted two people disappearing into a hole," recalled First Lieutenant Robert Barclay of Chamblee, Ga. "As we were advancing toward their position one of them tossed a grenade out of the hole. "I yelled 'grenade' and everyone got down. Luckily it failed to go off. While my men were keeping them pinned down with small arms fire, I crawled up and dropped a grenade in the hole." Along with two bodies there were two AK-47s, one B-40 rocket launcher and six rockets, one Chicom grenade, some AK rounds and some food discovered. After a break for chow the men again moved out this time spotting a small air hole in the ground. "After we spotted the air hole we threw a smoke grenade in to see if there was another opening," explained First Lieutenant Mark Davis from San Antonio, Tex. "When we saw the smoke coming from another small hole, we began moving towards it when two NVA popped up and opened up with their AK's." As before, the enemy was silenced by a grenade. This time two AK's and small arms ammunition and magazines were discovered. TAY NINH - Sometimes the Army works in strange and wondrous ways. Just ask Chief Warrant Officer Maurice Smith of Munich, Germany, property book officer for the 4th Battalion (Mech. ), 23rd Infantry, Tomahawks. In 1964, when Smith was a buck sergeant, he applied for a direct commission as a second lieutenant. But somehow, somewhere, the paperwork went astray in Army channels and nothing ever happened. Not to be dismayed, Smith applied for and received an appointment as a warrant officer in January 1966. That was four years ago. The mail of Feb. 18, 1970, brought Smith a large brown envelope from the Department of the Army. Inside the envelope was a certificate dated June 4, 1969, appointing Maurice Smith a second lieutenant in the Regular Army, six years after he sent in the paperwork. "It was quite a shock," said Smith. "It could be a joke but I'm having headquarters look into it. No, I wouldn't accept it. I've been in the Army 18 years and I'll probably retire in another two - besides, I'd probably be taking a pay cut." CU CHI - With a sudden change in mission, elements of Alfa Troop, 3rd Squadron, 4th Cavalry, located another weapons cache while on operations in the Boi Loi Woods recently. "We suddenly received a change in our mission to move farther east of Fire Support Base Wood III towards the Saigon River. After we moved into the new area, we discovered a clearing in the middle of the brush. "It just looked a little too suspicious, so it was decided to stop and check the place out. After getting on the ground and searching for about a half hour, we couldn't find anything. Then someone started jumping up and down. At first I thought he was going nuts. But I soon discovered that he had noticed a hollow sound under the ground." It didn't take long for the picks and shovels to be broken out and for everyone to start digging. "When we first broke through it looked like Charlie had brought a dump truck in and just dumped his load of ammo and weapons," Marthers said. "I was the first one to go down inside. Some of the first things I came across were a 60mm mortar tube, two base plates, 60 60mm mortar rounds, an RPG launcher and 147 rounds for it. "I also found 11 assault rifles and cases and cases of small arms ammunition with .51 caliber armor-piercing tracers among the ammo. DUC HOA - A combined force of ARVNs and 1/27 Infantry soldiers netted a rare bird on a recent ambush patrol out of Duc Hoa. Responding to an intelligence report, the combined force moved northwest of Duc Hoa where they awaited the arrival of an enemy finance official. "We set up an L-shaped ambush with the ARVNs on one side of the L and the Recon Platoon on the other," said Sergeant First Class Clarence Waggy, leader of the patrol. Movement was spotted shortly after the men were in position and the action was on. The men opened up with M60 machine guns, grenade launchers and M16's, killing one VC and wounding another. The dead VC turned out to be the finance officer. "We couldn't believe how he was dressed" said Sergeant William Strickland, who was also on the patrol. "He had a blue silk Nehru jacket on with matching pants, fancy sandals made of buffalo hide, a Longine watch and a K-54 Chicom pistol. "But the topper was the Panasonic transistor radio strapped to his waist - he must have been listening to the latest tunes with the earphone. Maybe that's why he walked into our ambush," Strickland said. The surviving VC had dragged the nattily-dressed official's body back into the woodline but had to abandon the area because of heavy combined U.S.-ARVN fire. A subsequent search of the area produced the VC body. The only hang-up to the whole operation was that the VC also had ambushes out that night. "The VC must have had security elements out to protect the finance official," said Captain William Goodman of Philadelphia, Pa., who came with jeeps from Duc Hoa to pick up the ARVN-U.S. patrol that night. "They were just getting on the jeeps when the VC opened up on us," he said. "They used RPG's and AK's but most of the rounds went high. It looked like basic training all over again as everybody crawled into a ditch along the road and returned fire," he said. One man, Specialist 4 Greg Hall of Spokane, Wash., was behind the 50 caliber machine gun on one of the jeeps when the action started and he was the first to return fire. "I had armor-piercing ammo in the gun at the time, with blue tracers. I fired so much the barrel glowed cherry red," said Hall. The action was "full of sound and fury," but there were no casualties on either side. The combined patrol returned to Duc Hoa without further incident. Is the Short GI Really Different? TAY NINH - How does a GI feel when he's short? How is he different from the guy that just arrived in 'Nam? In order to understand this ever-occurring phenomenon, one of those special individuals, Sergeant Jose E. Carrera of Placentia, California, was asked. Carrera immediately, with an enormous grin, shouted "its the greatest!" Carrera has been with the Manchus, 4/9, for a long time. He remembers Frontier City plus a variety of smaller, less well-known firefights. He has been wounded twice and has a long list of awards. Now he's going home. When asked about home, the sergeant started listing things he planned to do, such as marrying the girl he left behind and buying a new car - probably a sports car. In short, the future is what's happening for Carrera. Of course, there will always be memories of good times and perhaps those that were not so good, of things that could have happened, almost happened and sometimes did happen - memories, perhaps a laugh, probably a tear. Carrera came to Vietnam as a PFC, just as Donald A. Johnsen of Kenilworth, N.J. and Lawrence A. Difaleo of Warren, Michigan, have done. As is usual, the new guys are quieter. Johnsen put it his way, "Although reinforcement training tells you what to expect, I think one is unsure until he's been here a while." When asked about their girls, grins suddenly appeared - no difference here between the old and the new. They too, say they will probably marry when they return home. Both also are planning to save for a new car, probably a sports car. The big difference, as was suspected, was the self-assurance that one seems to develop after a tour in Vietnam. Undoubtedly Vietnam does build confidence and definately a zest for life. The 25th Infantry Division's supply system became automated recently when the 25th Supply and Transportation Battalion began using an NCR 500 computer system to keep track of the Division's supply accounts. 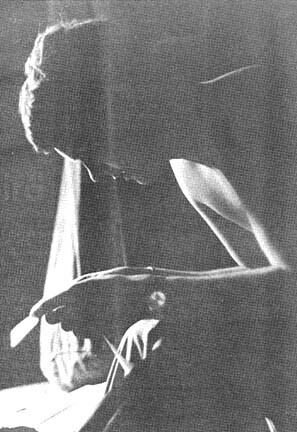 First Lieutenant Donald N. Miller, the officer-in-charge of the 25th S&T computer accounting system, believes that the new system will result in greater speed and accuracy in taking supply orders from unit supply offices throughout the Division, adding up the number of specific items needed and ordering those items from the U.S. Army Supply Depot at Long Binh Post. "When we had to fill out all of our ledger forms manually, we had to have about 20 men to do the job," he said. The new system requires only about 10 good computer operators. "And, of course, the machine is not subject to human error once it is told what to do and begins computation," he added. The computer system, centrally located in the Division Supply Office's stockyards, is set up in air-conditioned trailers which are kept fastidiously clean. All persons who enter the trailers are required to wear white overshoes on their boots in order to keep the trailers dust-free. Consequently, says Miller, inspecting officials of the Computer Systems Command have recommended to their headquarters in Ft, Belvoir, Va., that the 25th S&T computer set-up be used as an example for all other computer systems in the U.S. Army. The Roman Catholic sacrament of Confirmation was recently administered to a record number of personnel in the 25th Division. Third Brigade Chaplain Anthony V. Rodrigues of Honolulu, Hawaii, called the class of 59, "quite remarkable." "Usually we consider 15 to 20 a large class," he continued. "Such a large turnout is especially gratifying during Lent and in preparation for Easter," Chaplain Rodrigues added. Bishop Joseph Van Thiem, bishop of Phu Cuong, RVN, officiated at the ceremony held at the Division Memorial Chapel. Highest representation was by the 3rd Brigade with 14 members. Chaplain (Lieutenant Colonel) Roy Peters was the Confirmation coordinator. 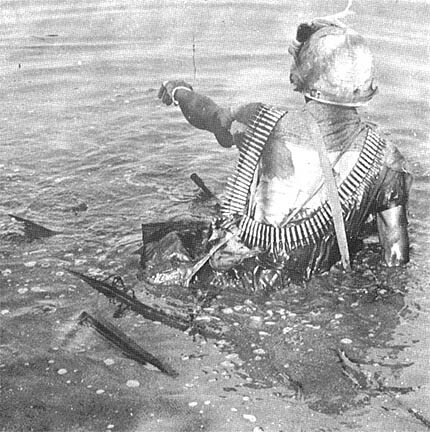 CU CHI - Don't look now, but Friday the 13th is almost here again. For most men of the 3d Brigade, Friday the 13th is "just another day." For some, however, it's a day they'd rather not endure. Last month, a member of Snoopy Aviation had to drive without his license in an emergency. Sure enough, the MP's stopped him, but the circumstances enabled him to be excused. A member of Bravo Company, 1/27 Wolfhounds was caught in the backblast of a claymore last Friday the 13th. Fortunately, he wasn't hurt. And, for a member of 3d Brigade Headquarters Company supply, Friday the 13th is always a headache. "I was inducted on a Friday the 13th," he lamented. On the other hand, another supply member feels it's his lucky day. "I was born on a Friday the 13th and I've won some prizes playing the number 13," he beamed. History says the ancient Vikings considered Friday to be their luckiest day of the week. The name Friday came from the Norse god of love. It became superstitiously unlucky when Christ was crucified on Good Friday after 13 men attended the Last Supper. Aside from Friday the 13th, superstition is evident in other ways within the 3d Brigade. One Snoopy pilot never flies without wearing a religious medallion. A member of Base Camp Defense always carries a Kennedy half-dollar, reasoning that "it got me safely through my first tour here." Another member of Headquarters Company wears his wife's pinky ring for luck. Out in the field, one Wolfhound warrior never goes out without wearing crosses on his helmet and neck chain. "I always carry four grenade pins in my helmet, too," he said. Another refuses to wear a flack jacket. "The only time I did," he scowled, "I needed a dustoff because of a painful insect bite!" A third Hound never decorates his helmet with any slogans or names. "The only time I did, my company was hit pretty hard," he remarked. And still another Wolfhound believes in a World War II superstition. "I'll never be the third man to light a cigarette from the same match. It's supposed to be bad luck," he recalled. The feelings of the vast majority can be summed up in the words of a brigade chaplain who replied, when asked if he was superstitious, "Are you serious!" CU CHI - Rushing to a wildly spreading grassfire that threatened to incinerate several barrels of diesel fuel, an officers' shower room and the battalion NCO Club, Tropic Lightning Troops of the 1st Battalion, 8th Field Artillery, kept the fire in check until the Cu Chi Fire Unit arrived and doused the area. 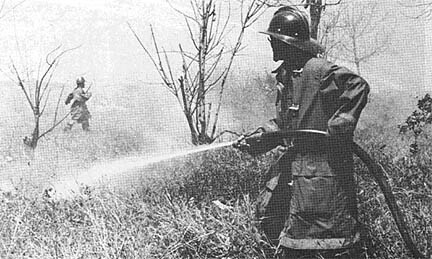 A carelessly used cutting torch in an area adjacent to the Automatic Eighth's Headquarters sparked the fire which deceptively spread and then raced out of control across a vacant field of dry weeds. First on the scene were Specialists 4 William Forster of New Orleans, La., Harold Warp of Chicago, Ill., Robert Hanson from Ypsilanti, N.D., and Private First Class Monti Ross of Decatur, Ind., who manhandled 55 gallon drums of diesel fuel out of the path of the fire. The artillerymen managed to keep the blaze contained in the vacant field and away from any structures. By the time the fire trucks had arrived most of the fire had been extinguished or was in the process of being beaten out. A sidelight to the action was provided by Sergeant First Class Herbert Legassie of Berlin, N.H., who was standing-by, awaiting the chance to spring into motion. Fortunately the flames were stopped short of Legassie's self-appointed charge - the NCO Club - and he was not called on to perform his self-appointed assignment. The 50-year-old career soldier had armed himself with an especially long-handled broom with which to beat off the flames if it became necessary, and stationed himself at the entrance to the club. Legassie modestly admitted that he was unselfishly prepared, if the fire had seriously threatened the club, to rush in and evacuate as many as possible of the highly combustible bottles of bourbon and rum. DUC HOA - Major David Dunn collects guns. At his home in Chattanooga, Tenn., he has dozens of firearms, both old and new. In his job as Senior District Advisor of Duc Hoa district, Dunn has found a way to utilize his extraordinary interest in and knowledge of firearms to improve the training of Regional and Popular Forces. The Major has assembled a collection of weapons which the VC commonly use against the RF-PF. These include a Russian 7.62mm machine gun, Mauler 98 bolt action rifle, .45 cal. submachine gun, Ml and M2 .30 cal. carbines, K54 Chicom pistol, as well as the more common AK47 and SKS assault rifles. Many of the weapons came from enemy arms caches which were located by U.S. or ARVN troops. "By using these weapons in the training programs, we try to show these young RF-PF's what they will be up against" said Dunn. "Young Vietnamese join the RF-PF at district level - almost the same concept as the National Guard in the United States. They are trained as a unit and emphasis is placed on five topics of instruction - small arms, mines and booby traps, small unit tactics, sanitation and first aid." "We don't try to scare these RF-PF soldiers with this emphasis on enemy weapons but neither do we want them to underestimate the capabilities of the soldiers they are fighting," he said. "A well trained RF-PF force is of inestimable value. They can guard their own hamlets, freeing the ARVN troops for duty in the field." "This in turn takes a burden from U.S. troops, such as the 1/27 Wolfhounds, who are operating in the district," Dunn said. PB KOTRC - One of the 25th Infantry Division's most isolated border outposts, Patrol Base Kotrc, has been dismantled by the men who built her. With the help of heavy equipment including Chinooks and Sky Crane helicopters, Alfa and Charlie companies of the 2nd Battalion, 27th Infantry, Wolfhounds, leveled their former home in about three days. Old bunkers, rusted concertina wire and hundreds of emptied sandbags were buried while artillery and equipment were airlifted to a new location. "It sure was a problem when those Chinooks came in blowing all that dust. We couldn't see two feet in front of us," said Charlie Company's commander, Captain William H. Schuler of Ripon, Wis. Many of the large bunkers had to be taken apart by bulldozers, while smaller ones were torn down by the men. "Those men from Alfa Company really worked hard considering they just spent the last two days in the bush," said Schuler. CU CHI - Seven weeks ago Phan Van Thanh was hiding in a bunker complex fighting and evading GI's. Recently he helped blow-up part of that bunker complex, killing three and capturing one of the enemy. Thanh's story began ten years ago when his parents escaped from North Vietnam to a village near Saigon. They left behind young Phanh, a private in the NVA. The Vietnamese stayed there until recently when he underwent three months of special training for guerrilla warfare and rocket employment. He was then sent south to face the 25th U.S. Division. Phan Thanh did not have much luck as a warrior, suffering several wounds before he reached his place of assignment. Eventually he did make it and this was all that he was waiting for. He became a Hoi Chanh at the first opportunity, realizing that this would mean a reunion with his parents. He was quickly trained as a Kit Carson Scout and on his first mission for the Republic he went out with Charlie Company, 2d Battalion, 14th Infantry. The area was the site where he came over to South Vietnam's forces. "Not 15 minutes after the operation started," said machine gunner Sergeant Larry Kelleg of St. Louis, Mo., "our new Kit (Carson) started yelling 'beaucoup VC, beaucoup VC,' making all kinds of noise and pointing to a small hole." "We dropped in a concussion grenade," said Staff Sergeant Marlin Butcher, Tampa, Fla. "Out popped two Chicom grenades and some AK-47 fire." A barrage of U.S. hand frags answered the communists' fire. After that the only thing to come out of the hole was a thin "Chieu Hoi." "Besides the four NVA put out of action, 30 pounds of medical supplies, two AK-47's, one K-54 pistol and a few hand frags were recovered. "These Kits are a crazy way to fight a war," said Butcher. "But it really works, and what the heck, it's a crazy war." 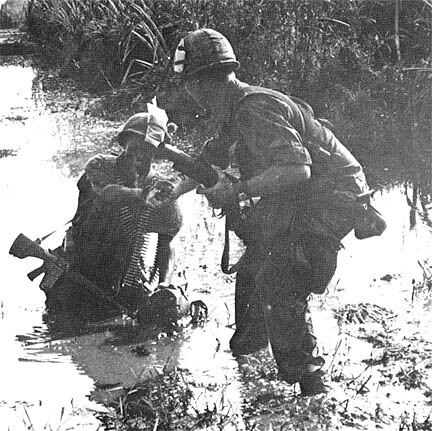 With dust rising on the roads and rice paddies hard as cement, it was not a pleasant surprise when Alfa Company, 2d Battalion, 14th Infantry, jumped off their choppers into waist deep mud. The mission was to search the site of an ambush patrol of Charlie Company, Golden Dragons, on the previous night. Charlie Company's 1st Platoon was set up 800 meters northwest of Fire Support Base Hampton when 35 to 40 NVA attacked. "It was bright as day with the full moon," said Sergeant Jerry McDow, Hermitage, Mo., a squad leader in the 1st Platoon. "They attacked what they thought was our weak point. But we got a machine gun there mighty quick." Four enemy were confirmed dead, McDow said. There were at least five heavy blood trails. With nine or fewer enemy dead out of the original 35, it was Alfa's job to find what happened to the rest. After being dropped in by helicopter, the company reconned the area with small arms fire and then moved toward the most likely avenue of escape for the enemy, a stream and swamp. "Man that mud was like quicksand," said Private First Class Charles McFall, Benton Harbor, Mich. "It was like someone was under the stuff grabbing me and pulling me down." 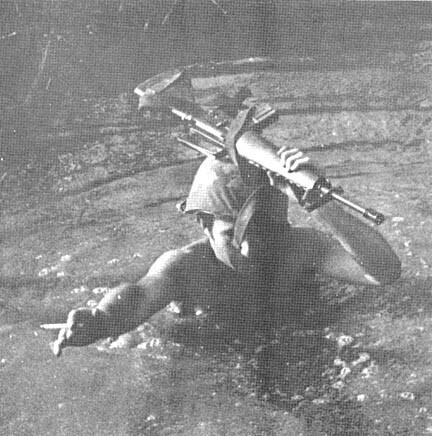 Private First Class Hugh Hearn Jr., Johnsonville, S.C., was given the dubious honor of going through the stream itself in search of hidden caches or signs of recent infiltration. "I didn't find anything the Army would be interested in," said Hearn. "But I did find this beauty of a snake I think I'll give to the someone who gave me the job of going through that stream." After checking the stream, the swamps around it, and asking questions of local civilians, it was time for Alfa Company to go home. They fought no battles this day but looked as if they had fought World War III with mud pies. 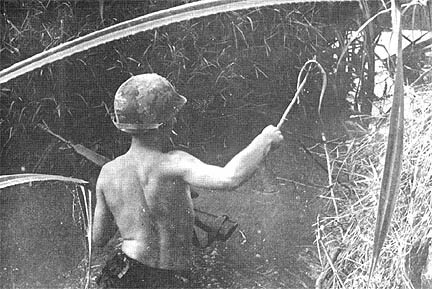 CU CHI - Covering an area from the peak of Nui Ba Den to the lowlands of the Mekong Delta is a large task for five or six men. 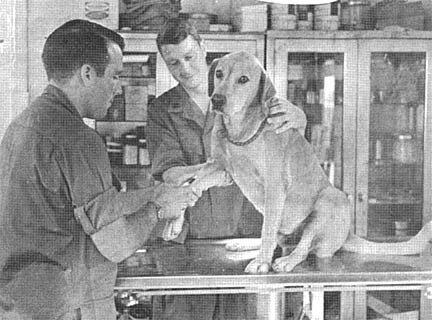 Captain Gary L. Gosney, 25th Infantry Division Veterinarian from Ft. Worth, Tex., his colleague Captain Dennis A. Brewer of Webster City, Iowa, and a handful of animal technicians and food inspectors do just that. The small but highly capable unit examines items that range from a jungle python to a good old American hot dog. Working in the 522nd Medical Detachment and the 44th Medical Brigade, Gosney and his staff have a four-fold mission. 1) To provide veterinary food inspection services and help buy store, and ship food. 2) To help the Division surgeon prevent diseases that may be carried from animal to man, inspect food sanitation and provide veterinary preventive medicine. 3) To provide medical care to military-owned dogs of the 25th Infantry Division. 4) To provide emergency veterinary care for animals belonging to U.S. government personnel. "We conduct weekly checks on all eight dog platoons of the 25th Infantry Division as well as monthly IHS tests (a white blood cell count)," Gosney said. The chance that an animal will have rabies increases as the number of animals increases. The staff of the Division veterinarian keeps ahead of the problem by conducting tests on animals. "What might be good to keep in mind is that there are three types of rabies," Gosney said. We have the furious type which is the mad dog, the dumb type which is exemplified by the animal acting lazily and in an awkward manner. The third type is atypical. The third type of rabies may be a resemblance of the other two. "If a person is bitten by an animal, he should report to a medical dispensary. The animal should be captured alive so a quarantine of ten days may begin to determine whether the animal has developed the disease or not. If the quarantine proves positive the person must go through a series of 14 to 21 shots over the same amount of time. The number of shots is determined by the severity of the bite." Gosney has not limited his practice to just the canine set. His list of animal patients is long and includes a deer, a boa constrictor, a mountain lion and a variety of lizards. "We care for 159 military dogs and a number of pets owned by the soldiers. We examined more than 230 GI pets in January," Gosney said. "If it is unfeasible to treat a dog here, the animal is medivaced to the 936th dog evacuation hospital in Long Binh." TAY NINH - When Nguyen Van Van joined Charlie Company, 4th Battalion (Mech. ), 23rd Inf., as a Kit Carson Scout in November 1969, everyone wondered if he would be of any help to them. He was assigned to the third platoon and they nicknamed him "Baby san" because, although he was 18 years old, he looked about 12. The nickname stuck and now it's the only name he answers to. Before he rallied to the government "Baby san" was in charge of the VC force that laid mines in Highway 26. These activities didn't endear him to the members of Charlie Company, who had distinct recollections of muffled explosions and flying roadwheels. Nguyen proved his worth however, when, after being with the company only a few days, he recognized and captured one of his former mine laying team. That episode, coupled with a wide, infectious grin, helped "Baby san" win the confidence of the men in the third platoon. "Baby san" recently proved himself in a more daring manner. On Feb. 16 the 3rd platoon was on a mission near FSB Hunter when "Baby san" yelled for his friends to halt. He had spotted a booby trap on the trail and advanced to disarm it. He noticed that the booby trap was protecting a tunnel entrance and refused to let the G.I. 's near until he checked it out himself. Inside the tunnel he discovered 30 82mm mortar rounds, 6 boxes of fuses and 6 cases of powder charges. "Baby san" lugged his precious cargo to the tunnel entrance before calling for help from his buddies. "The little guy is really a great help," said Staff Sergeant Robert K. Smith of Wayland, New York. "I'm sure we would have tripped that booby trap if "Baby san" hadn't stopped us." Now "Baby san" is "one of the guys." He goes everywhere with the men of Charlie Company and his new found friends are happy to have him along. DEAR SGT CERTAIN: While living in base camp, I discovered and became very attached to a large cockroach. I have since named him Richard, taught him tricks and walk him daily. The problem is that I DEROS next month and I want to take him home for my wife. Is this possible? DEAR BUG-IN: There is nothing in the Army regs that specifically rules out exporting cockroaches, but your friend might have trouble with the customs boys. In the States cockroaches are often called names, but rarely "Richard." But are you sure your wife would appreciate this pet? You know they are less popular in America. True he would be easy to feed and could live behind the kitchen cabinets, but we are told that he would not be afforded protection by the ASPCA, and the National Pet Show does not have any class where he is eligible. Have you considered finding a more affectionate pet, say a boa constrictor? DEAR SGT CERTAIN: Last week I got drunk and ordered 20 copies of the 25th Division yearbook from the Tropic Lightning Association. I'm sending one to my parents, one to my girl and one to my mother's maiden aunt in Muncie, Ill. What should I do with the rest? DEAR OVERSOLD: The Division yearbook may be worth the money, but you certainly did get carried away. Perhaps you can pile the books in front of your bunker. Since it is hard cover and rather thick, it might save you sandbagging. You could use the combat shots to plaster on the wall over the cheesecake pictures at IG time. 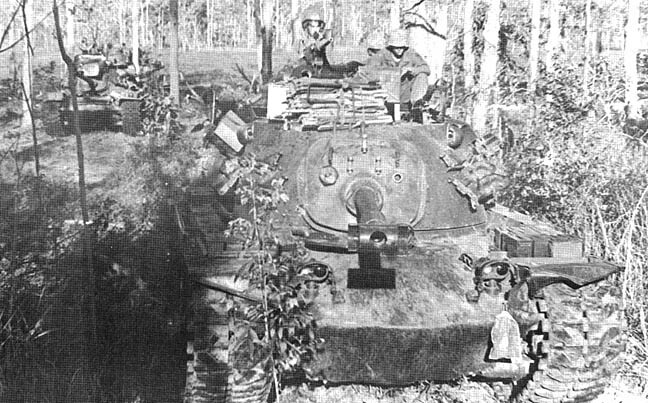 TAY NINH - The tanks of Alfa Company, 2nd Battalion, 34th Armor, smashed through thick jungle growth proving their worth to the Manchus of 4th Battalion, 9th Infantry, during operations north of Tay Ninh recently. The "monsters" joined the Manchus' list of favorite support elements by ferreting paths through the thick underbrush and uncovering large enemy bunker complexes. "We never would have been able to get through that woods, much less make the search if we hadn't had the tanks along to make a way for us," said Specialist 4 Michael Hobbs of Avoca, Pa. The tanks crashed through growth so thick that at times the tank commanders found it impossible to see the front of the tank from the hatch on the turret. The combined watchful eye of the Manchus and the devastating power of the Dreadnaughts were credited with helping discover and destroy the numerous well-constructed enemy bunker complexes. 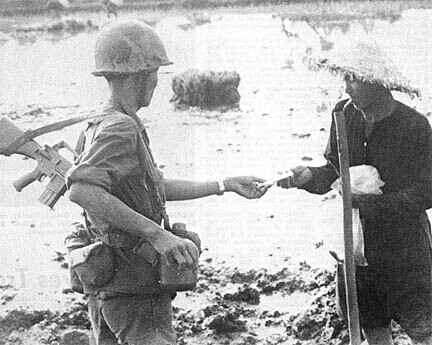 MUI LON - Medical Civic Action programs in the 25th Division's area of operations are no longer completely made up of American soldiers treating only physically ill Vietnamese civilians. The emphasis now is on training Vietnamese civilians to work as nurses in the field of preventive medicine. During a recent combined Medical-Dental Civic Action Program held in this small hamlet near Cu Chi, Major Lawrence J. Heitzman, the Civic Affairs Officer for the 25th Medical Battalion said, "The Med-Dentcap Program is going from Phase I, where we did it ourselves, to Phase II, one of total Vietnamese participation. We are starting now to train six young Vietnamese women who will soon be running their own Medcaps." The health project held in this small hamlet was a demonstration of the new concern for the Vietnamization of Civic Action Programs. There were numerous ARVNs and Kit Carson Scouts mingling with the crowd, acting as interpreters, playing with the children, and encouraging the elders, though little encouragement was needed, to accept the treatment of the doctors and nurses. There was the usual treatment for typical illnesses, but more time was spent training the people in the methods of resisting disease. Specialist 6 Charles Abbot of Anchorage, Alaska, the NCOIC of the Medcap team pointed out that the reason Medcaps have been able to shift to preventive medicine is because "there seems to be a general improvement in the health of the people. I would estimate that in just the past two months there has been as much as a 65 to 75 per cent decrease in the infection rate in this area. "The villagers are starting to keep themselves clean . . . starting to cover cuts and bruises they receive." To encourage the villagers in their efforts, the Medcap team brings with them a field-expedient portable shower. The shower, designed by Sergeant Gino Torre of Brooklyn, N.Y., a member of the 725th Maintenance Battalion, consists of a water tank and pump on the back of a flat-bed, three-quarter ton truck. The tank is attached to a stand-up sprinkler system by a rubber hose. When asked why he set up the shower, Torre said simply, "The kids were dirty." Captain David Firestone, a 44th Medical Battalion dentist, who works regularly with the 25th Medcap team, said, "Almost anyone can treat an injury or a disease, whether it be in the teeth or any other part of the body. I felt that the key was to teach the villagers the importance of taking care of their bodies." And this feeling is demonstrated not only by the shower but also by the oral hygiene classes that are given to the village children. The class begins with a lecture by one of the team's ARVN interpreters, Sergeant Vo Minh Khua. Khua picks out a toothless old man and explains to the children that unless they listen to Firestone, use the toothbrush and the paste he gives out, they will also end up toothless. Firestone shows the children how to brush using the same red-colored dentistry paste that is issued GIs when they arrive in country. The children then take the Disclosing Pills that show, by staining the dirt and plaque, what areas were missed by the toothpaste. The villagers welcome the team, its shower and toothpaste, but one gets the impression that they are especially pleased to see so much Vietnamese participation on the team itself. CU CHI - The 25th ARVN Engineer Battalion with supplementary help from Echo Company of the 65th Engineers recently constructed a pontoon bridge across the An Ha canal, opening Route 224 between Duc Hoa and Ben Luc. 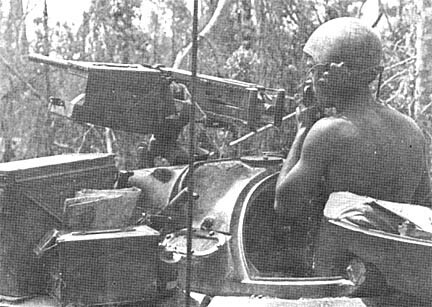 Captain Buu De Nhi, ARVN, commanded the joint operation with the American engineers providing only extra manpower. 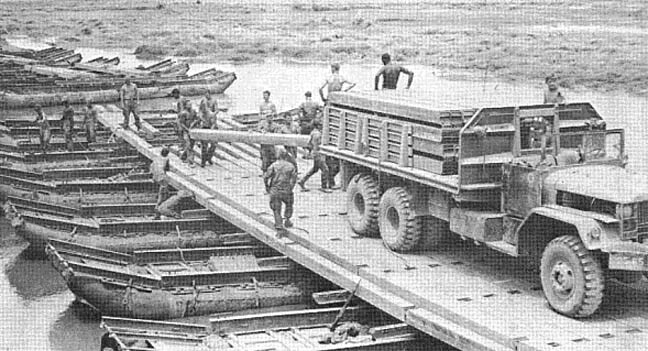 Twenty US and ARVN men were required to position the seven large pontoons with the help of an ARVN operated crane. After each pontoon was positioned, the joint force constructed the heavy saddle assembly of beams and metal panels. A minor crisis almost came about when the crane was unable to lift the heavy "pre-pack" shoulder assembly. But Yankee and Vietnamese ingenuity and strength overcame the problem with a loss only in time. The American advisor to the 25th ARVN Engineer Battalion said of the operation, "This is not the first time that we (the 25th ARVN Engineers) have worked with the 65th Engineers, and we get along harmoniously." The 25th ARVN Engineer battalion came to the Duc Hoa region in 1964. The new An Ha canal bridge will service nearby Patrol Base Handel, which the ARVN's have occupied since the first part of January. 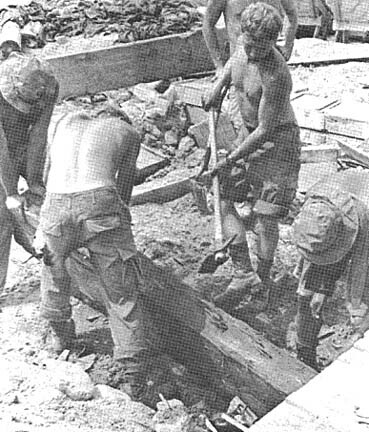 HELPING THE ARVNS BUILD - Members of the 65th Engineers help ARVN engineers build a new bridge across the An Ha Canal. The temporary bridge later will be replaced by a permanent structure. TAY NINH - The Canine Impact Award was presented recently to King, a four-legged member of the 46th Scout Dog Platoon. His reward as scout dog of the month was a juicy raw steak presented by 1st Brigade Commander, Col. Paul J. Mueller Jr. The dog's handler, SP4 Joseph Tanner of Los Angeles, was named Dog Handler of the Month and was presented an Army Commendation Medal by Mueller. 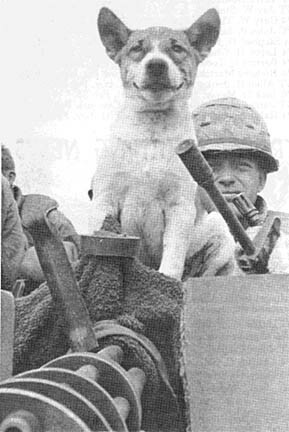 King received his reward for a mission that he and his handler went on with an element of the 3rd Battalion, 22nd Infantry, near the Cambodian border. The dog alerted on an NVA base camp and the contact that followed resulted in 25 enemy dead. Mueller expressed his appreciation for the outstanding job being done by the entire scout dog platoon. "I've had several discussions with the battalion and company commander," he said, "and they just don't want their units going out without one of these dog teams along. It's not fun being point man all the time, but that's what you men are, and you're all doing a real fine job." Have you found a new, imaginative, or exotic method for preparing C-Rations? The Tropic Lightning News is attempting to gather information for a feature story entitled "C-Ration Delights by Field Gourmets." If you know of any novel ways in which to make C- Rations more tasty, please contact the 25th Infantry Division Information Office. Write to the Tropic Lightning News, Information Office, 25th Inf. Div., APO In-Country 96225. DAU TIENG - A door gunner for the 116th Assault Helicopter Company, a tunnel rat and a point man for an infantry platoon have one thing in common: very dangerous jobs. But possibly the most dangerous non-fighting job in Vietnam is mail clerk. "A mail clerk can be your best friend or mortal enemy, depending upon how much mail you get," said Specialist 4 David Ryder of Sag Harbor, N.Y., describing his job as a mail clerk for Headquarters and Headquarters Company, 1st Battalion (Mech. ), 5th Infantry. "It's a great job because you meet everybody, but I've actually had people say 'I don't want to talk to you, you didn't give me any mail,' " he added. To the soldier in Vietnam, mail means more than a Sydney R&R or a seven day leave to Vung Tau. But when the mail doesn't arrive it's as a writer once noted, "Hell hath no fury like a soldier without mail." Specialist 5 Jim Stallions of Dwight, Ill., the chief Bobcat mail clerk says the worst part of his job is when a guy learns he has a package on the way. "They'll come to the mail room five times a day asking about the thing. I've had people want to search my mail room because they think I'm holding back their mail," he said. Ryder said he once thought of typing a form letter he would give to anyone who did not receive mail that day. The letter would inform the individual there was no other mail for him, but at least it would be a letter. For the helicopter door gunner, the tunnel rat and point man there is often a chance for a job in the rear when he gets short. But there's no such luck for the mail clerk, he is doomed to stay on the firing line until DEROS. There is one big consolation for the mail clerk. Even though he can't bring mail to everyone each day, he knows that he brings smiles to the faces of a majority of the men he serves with greetings from sweethearts, family and friends back in the World.